I’m running the Marine Corps Mud Run with my brother, sister and husband this weekend and the anticipation of the event has really kept me on top of my workout regimen. This got me thinking of you and wondering if you were doing something right now to keep yourself motivated and working out regularly. Sure, its ok to take a break from exercise every now and then but for the most part, you should be so used to regular exercise that you feel ‘off’ when you go without it for more than 5-7 days. So what are you doing to keep yourself on track with making exercise a part of your lifestyle? If you’re in a slump right now here are a couple suggestions to keep you on track to becoming and staying; long, lean and beautiful. Keeping health on your mind is important for maintaining regular exercise and a healthy diet. With work, kids, friends, travel and other commitments constantly keeping us busy its hard to remember that we should be snacking on nuts, not chips & dip. If you’re not into books, subscribe to your favortie healthy living blog or buy a fitness magazine subscription to keep health in the back of your mind at all times. 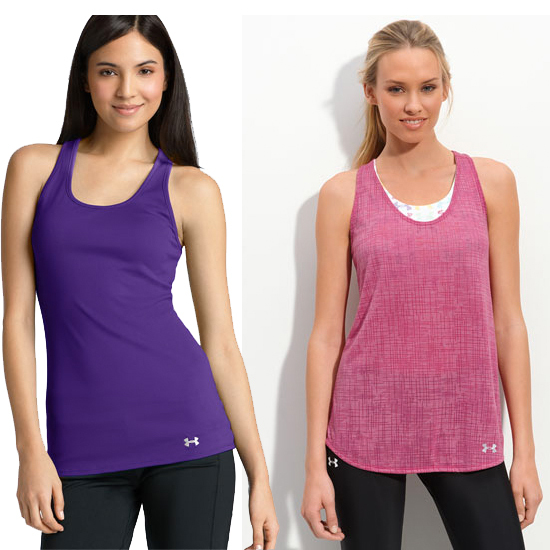 Best Cross Training Tank- I LOVE these two from under armor. The purple one is tight but also not so tight but not too tight. It lys really nicely. The pink is awesome for a day when you’re not in the mood to ‘show yourself off’ and is breathable and so comfy too. Best Cross Training Capri- Nike Capri. I love the cut in the back. It really hugs my curves and flatters my back side! They dont budge while I move from plank to a jump squat so I don’t ever have to re-adjust my outfit while training. Best Pant- Victorias Secret. I love this pant and have bought 3 pairs over the past 6 years. They last a LONG time (they fabric is think and durable) and they are also very warm. Awesome pant. If you like straight leg workout pants then the straight leg version of this is great too. Post your goals and progress on Facebook, and Twitter. Add photos of yourself as time goes on and enjoy all the accolades along the way! Schedule a workout with a buddy! Having someone else hold you accountable to a time and place for a workout means you’re likely to stick to the commitment. So grab a friend/sweat buddy, print out one of my workouts and make it happen! These are all temporary fixes so you will find that you need something else to keep you on track once the novelty wears off. Remember that self control and discipline are the biggest contributors to overall good health so the power to remain on track with your health and fitness goals is within you! Its hot out but you can take advantage of the heat by embracing the sweat it produces! Its GOOD to sweat a little as you’re in and out of appointments or while unloading the groceries or while walking the kids to the pool. Its detoxifying and it’s way to know for sure that you’re burning calories. Sweat on folks! Your body loves it so you should too.